So after trying Five Cows and Toast Box in Trinoma, I would suggest that you try out Sizzling Pepper Steak! This is a fun restaurant inspired by Pepper Lunch in Singapore (or was it a rip off? check out Nina’s post). The restaurant visionary behind Peri Peri Chicken and Tokyo Cafe in MOA (which we love), opened the first branch of Sizzling Pepper Steak in Trinoma. The resto uses a cow icon that resembles Teriyaki Boy. Trinoma is huge and navigating your way around the mall could be a challenge. When you see La Maison, go down one more level and you should see Sizzling Pepper Steak along the rows of restaurant in level M1. You got to try it. 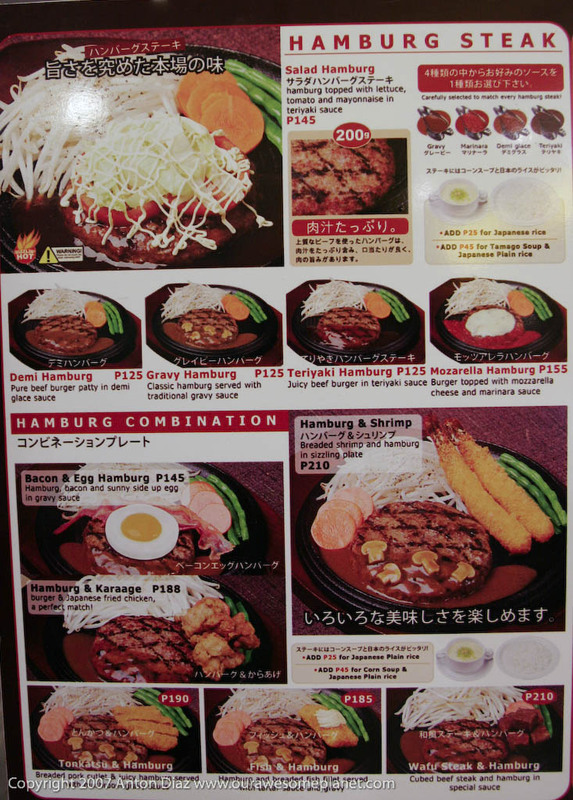 The best sellers in the house are the Hamburg Steak and the Sizzling Pepper Rice. What makes the restaurant unique is the “expediently fast patented hot plate system” for cooking the meat. It uses an oval sizzling plate for cooking the meat on the spot. We liked the pepper rice variation but find the hamburger steak ordinary. I was surprised that the meat of the hamburger was still soft even if I overcooked one side of the meat. Despite the cool exhaust on top of the tables, you’ll still smell like the steak when you get out of the restaurant. Beef Pepper Rice (P165). Thinly sliced beef, seasoned with cracked pepper, garlic butter with teriyaki sauce. It definitely looks appetizing and I liked the way it was served a little raw so that you enjoy the meat at the moment it is cooked. Step 1. Cook the steak on both sides while spreading butter on it if you prefer. Step 2. Mix It! Put the meat on top of the rice and mix it. The rice is a delectable combination of garlic butter, roasted pepper and teriyaki sauce in the middle of the plate. Step 3. Be generous with your sauce as your taste allows, a choice of teriyaki sauce or sizzling steak sauce. I prefered the combination of the two sauce. Salad Hamburg Steak (P145). Hamburg topped with lettuce, tomato and mayonnaise in teriyaki sauce. I forgot to turn the hamburger immediately so I kinda burned the one side of the burger. Ok. I’m now hungry to go back to Trinoma! ThankYou.PH – an Art Project on saying “Thank You” in a creative way. Did you miss watching Avenue Q? Give Ruv of Avenue Q tickets on Christmas Day! Wow, must try this resto, so glad I live near Trinoma, and you’re right it takes time to really learn your way around the mall. Thanks for the info…glad your family is enjoying Trinoma now. 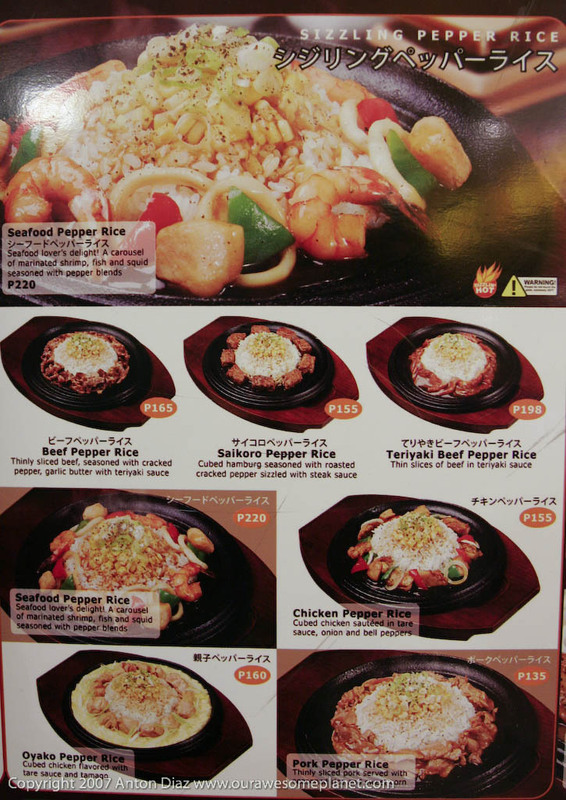 We just got the master franchise for Pepper Lunch Philippines from the Suntory Group in Singapore. Hope to see you and your family in our first store next year. bad trip ka talagang la sallista ka! ginutom mo ang atenistang ito! thanks for the heads up, bro! Oh wow thanks for the heads up! I should really explore Trinoma! I was able to try this resto when it first opened and I have to say, my dining experience there sucked to the highest level! The food was blah – it arrived 30 minutes after we ordered and the service was even worse! They forgot all about our orders!! Can you believe it?? 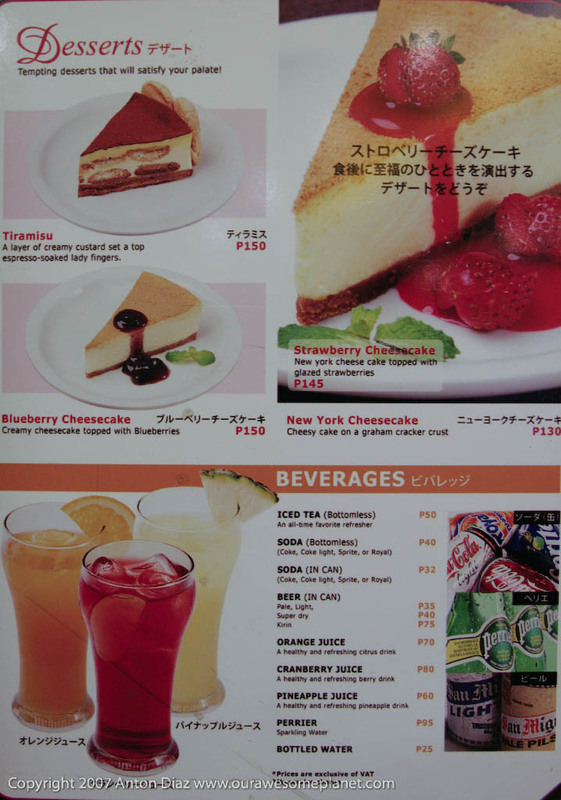 I ate at this place once with my family. The food is not something I would rave about. Oh Wow! Hi Cecile! I’ve been raving about Pepper Lunch to my friends! Was in Jakarta for 3 weeks and Pepper Lunch was what got me thru after I overdosed on ayams, gorengs and bakmis! Pepper Lunch is the BEST!!!! I so love the eyerollingly luscious shokuji steak and the burger-chicken fillet combo! YUM!!!! Can’t wait!!! ay oo nga, anton. 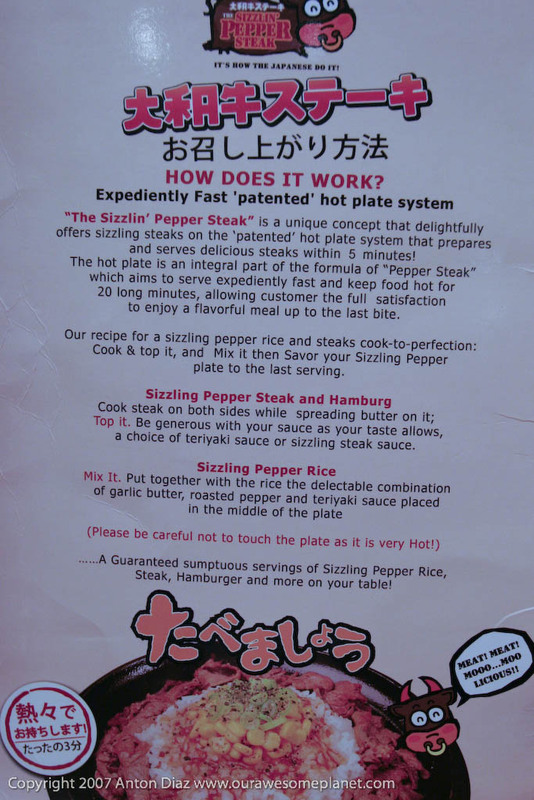 maybe this sizzlin’ thing is a rip-off of pepper lunch. i love pepper lunch and their thoughtful touch of putting a protective paper shield around the sizzling plate. i guess they don’t have the signature garlic sauce of pepper lunch. 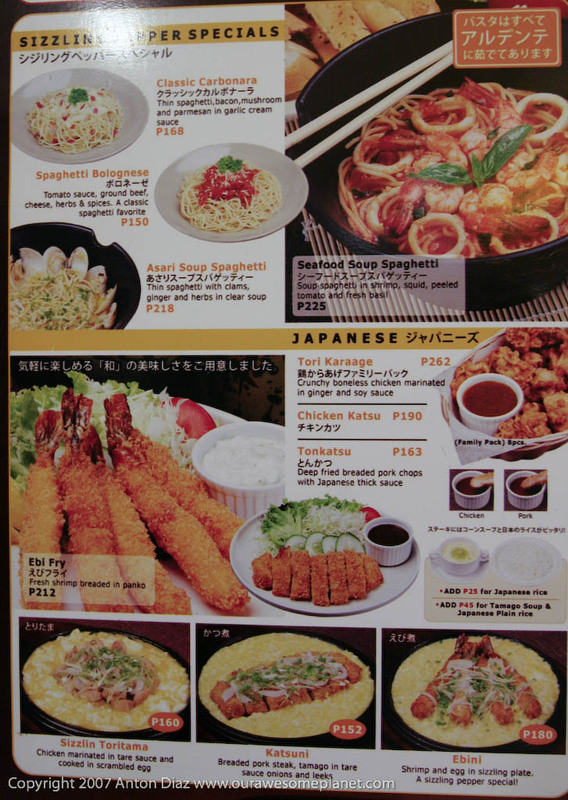 grabe… i’ve been hankering for pepper lunch! i hope the concept flies in the phil. it can be a tad too peppery (but what’s great is the option to not dust the rice with pepper…). quite high-end pricing given it’s a fastfoody concept but it’s top quality meat and the service is quick! so happy we’ll have it in manila. i seriously wanted to have a franchise of it! I’ve eaten both at Pepper Lunch Singapore and Sizzling Pepper Steak at Trinoma and all I can say it’s like comparing Australian ribeye and Batangas beef. Although the SPS ribeye tasted good, it took 48 years to chew and I was scared I would choke on the meat. I mean for P250 ribeye what can you expect? i’d rather eat home-cooked tapa. Now Pepper Lunch, I can’t wait! I didn’t like that sizzling pepper steak place. So excited that Pepper Lunch is coming in!! hi anton. I was so happy to find your site at the time I was thinking where to treat my best friend last Oct.19 (my bday). We decided to try this (as you’ve given great raves) and we were not disappointed. She ordered the Seafood Rice while I tried the Beef Pepper Rice. Yummy and the price is just affordable too!!! I will definitely go back there. Congrats for your new baby nga pala. And more power to OAP!!! well this resto is kinda intimidating at first,,,medyo d pang-masa ung price,,pro reasonable nman pla ung price,,cause when i get to taste one of their meals,,i have to admit,,it really tastes satisfying.once ko p lng ntry ang food s knila,,pwedeng balik-balikan.not to mention friendly staff,,nkadagdag s presentation ng resto ung mga staff nla n nag-aassist s mga guests.hi to mon, bj, emil, ms. elai and d rest of the staff of SPS..two thumbs up 4 all of u..good luck and sna dumami p ang guests n nagpapatronize s resto nyo..
We ate in sizzling pepper steak may 10, 2008. My wife, son and I were disappointed. Their food servings were not adequate with their prices. I ordered the sizzling seafood for P 245.00 and all I got was 5 small shrimps, 3 pieces of small fish bits, 3 thin slices of squid and few cuts of green pepper. My son had the kiddie meal of spaghetti bolognaise while, my wife had the chicken vegetable salad. My wife said because of their high pricing and poor service, this restaurant will not last. Hi Anton! I tried Sizzling Pepper Steak and it’s really yummy ha! Mas ok sya kesa sa Pepper Lunch sa Singapore. Fast food style lang kc unlike in Trinoma, cozy ambiance, nice interiors and superb ang service nila. Must try yung chicken Salad. 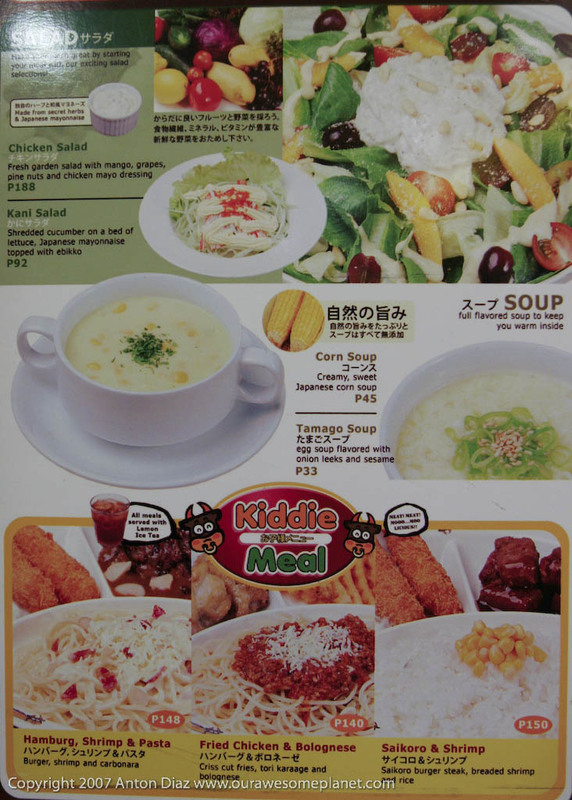 They have Kiddie meals like Hamburg Shrimp and Pasta, panalo sya for kids talaga. Soup goes well din with the steak. I tried SPS trinoma and the newly opened Katipunan branch, all i can say is that sizzling pepper steak is a nice concept which can confidently stand up on its own, i tried pepper lunch before and when it opened in rockwell, food was good but the burger was RAW and the line that i had to go through was too long. Anyway, maybe more products from SPS would excite me, looking forward to that guys. Thanks and Bon Appetit. is there wagyu beef in sizzling peeper steak? I went to the one in Eastwood which newly opened. I felt “fake Japanese rest” again. They imitate the outside only but not inside also. Do you know why? Because the service is awfully terrible. We went there by 3 of us. They made us fill in the order form by ourselves. After 16 mins, no water yet, then we complained. After 18 mins, pork pepper rice came up, but he ordered beef one, then he complained. After 20 mins, Raw chicken came up on the warm plate, not hot and couldn’t cook its inside. After 22 mins, Hamberger with egg came up, but I ordered diablo, then I complained. After 24 mins, no rice for me yet, then I complained. After 26 mins, beef pepper rice came up at last. The belling was wrong with another which we didn’t order. Then we asked to check the order form but they said they threw it away. My friend told me that almost the same thing happened in Cebu. just they copy the shape but not the most important thing hidden inside. And people here judge each other in the same way just like this. That’s why we can see all fakes, imitations everywhere here. I was the the new SM Fairview branch and the service was pretty good. The Beef Pepper Rice was good except they made it “too Pinoy” such that there was barely any pepper! It was very sweet instead of peppery. I was in a rush and ordered the beef well done which they did for me. The only problem is that it is a bit too expensive for me to go there a lot. Bad experience with their Glorietta 5 branch. Very bad service. By the time they serve your food, your hunger has passed. We ended up canceling my son’s order because it’s talking so long and ask my kid to just eat at Sbarro, which is beside Sizzling Pepper Steak in Glorietta 5. Me, my wife and other kid, our orders came one after the other (but without my other kid’s order) after about 30 minutes of waiting. Not ever coming back. Yeah. Well, I recently ate here at Sizzlin’ Pepper Steak Trinoma Branch… I had supper. Guess what? Their Beef Pepper Rice gave me horrible food poisoning. It was a freaking nightmare that I wanted to wake up from. I guess it was the meat. They served me poor quality meat. I was rushed to the Emergency Room right after I went home from Sizzlin’ Pepper Steak in Trinoma. I was vomiting like crazy. I vomited 22 times before being rushed to the Emergency Room. I felt like my insides were being scraped and poked and bruised and my throat was in pain from all the uncontrollable vomiting. It was one THE worst and most painful food experience of my life. I advise all of you to watch what you eat in this restaurant or to just not eat there at all. I don’t want anyone else to endure what I went through with this restaurant from hell. I AM NEVER EVER COMING BACK! It was a waste of money on garbage food. Plus, I still had to spend additional cash for my trip to the ER. I also had to stand the embarrassment of uncontrollably vomiting numerous times on the Emergency Room, the side of the hospital, the street (with people looking at me with total disgust), and the cab. PLEASE, PLEASE. DO NOT EAT THERE ANYMORE. Take this as a warning… Eat at your own risk.